From the moment I exited Milan railway station (commonly known as the Milano Centrale), I immediately realised that I had landed in a truly special place for my short weekend trip. The beautiful architecture, the rich smell of fresh pizzas, and the eclectic fashion statements made by the locals welcomed me with open arms, establishing Milan as one of the cities everyone should experience at least once in their lifetime. Before travelling to Milan, I had done very little research into the city. I only really knew of the Duomo, the remarkable cathedral, and that the city was known for its fashion. Thankfully, I was travelling with my wonderful sister, Sophie, who was adamant that we experience as much of Milan as possible. One thing that we were both in agreement with was the importance of focusing on the arts scene in the city, so we headed directly towards what was my favourite museum during this trip, the El Museo del Novecento. I was pleasantly surprised by how well this museum seamlessly combined both older and newer artwork by Modigliani, Picasso and Kandinsky, alongside contemporary works that focused on experimental kinetic and programmed art. The El Museo del Novecento not only emphasized this juxtaposition in the artworks it showcased, but also in its modern architecture which stood opposite the towering and traditional Duomo cathedral. Personally, I believe the view from inside the museum was just as stunning as the varied works it contained. In addition to the other art museums which we had the pleasure to visit, we also made sure to learn more about the history of Milan itself, leading us to tour the Sforza Castle. Built in the 15th century, it is still a powerful force in the centre of the city. We were lucky enough to see Michelangelo’s Rondanini Pietá, a beautiful marble sculpture depicting the Virgin Mary mourning over the death of Christ that was worked on until the last days of Michelangelo’s life. Aside from the many cultural aspects of the city, another distinguishable characteristic of Milan is the enticing cuisine. My sister and I visited as many delicious restaurants as possible, and it is safe to say that my favourite café by far was inside the Prada museum. It was not only the flaky croissants and rich coffee that made this café so memorable, but the design of the small space as well. 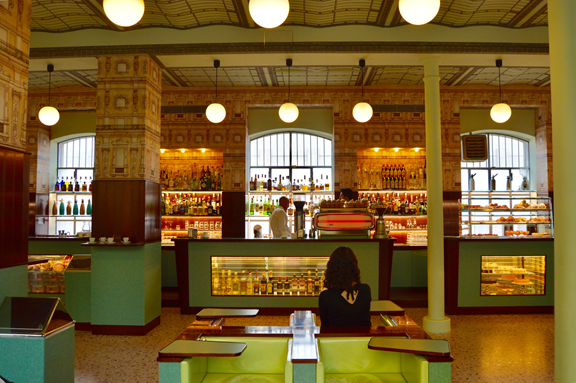 My sister surprised me by telling me that this café, Bar Luce, was designed by one of my favourite directors, Wes Anderson. The whimsical layout and vibrant colour scheme made me feel as if I had been dropped right into The Grand Budapest Hotel, and I absolutely loved it. To finish off this fabulous trip, we decided to tour Leonardo da Vinci’s vineyard located near the church of Santa Maria della Grazie. This vineyard can be accessed through the Casa degli Atellani, a magnificent house that once belonged to a family of diplomats in Milan. It is said that this vineyard is where Leonardo da Vinci grew his grapes for making wine as he was painting his renowned work, The Last Supper. Stepping into both the house and vineyard allowed me to experience for a few moments what life may have been like in Italy during the Renaissance. The rich culture and history that can be found in Milan is now deeply impressed in my memory. Since this was our last excursion within the city, I instantly decided that I must return to this enchanting place. Anyone up for another short weekend trip? A presto, Milano!